In the 1650s, most people in Europe thought of Austria as a place where instead of freedom they had rules that everyone had to be the same, and everyone had to be Catholic. But the Austrians saw themselves as the Holy Roman Empire, the core of civilization and God, with Islamic enemies on one side and Protestant enemies on the other side threatening barbarism. When Ferdinand IV died in 1657, his son Leopold ruled after him. Austria became stronger and better organized – but still not interested in freedom or the Enlightenment. Leopold even threw all the Jewish people out of Vienna in 1670. Leopold didn’t realize it, but Austria-Hungary had a problem that was getting bigger. Without control of Spain or the Netherlands, they had no overseas colonies to exploit. France and England and the Netherlands were getting richer and richer by enslaving and exploiting people in Africa, Indonesia, and the Americas. But Austria-Hungary was not. In addition, without an ocean or a navy, Austria-Hungary found it harder to sell things they made. Slowly they were falling behind the rest of Europe. 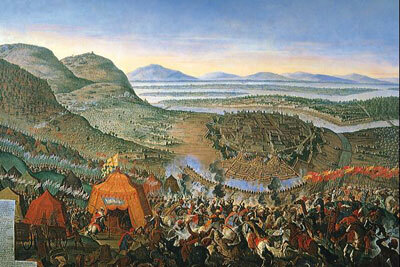 In 1683 AD, the Ottoman Grand Vizier Kara Mustafa Pasha used his base in Hungary to attack the city of Vienna in Austria, terrifying people all across Europe with the idea that they were going to be invaded by scary Islamic foreigners. In fact the Ottomans lost their battle, but afterwards Europeans were so scared that they republished the astrological predictions of the astronomer Tycho Brahe, from a hundred years earlier, to reassure themselves that the Ottoman Empire would soon collapse. As soon as Austria had recovered from the Ottoman attack, they had to fight another war: the War of the Spanish Succession. Austria was fighting France again. This time they were fighting over who would be king of Spain. 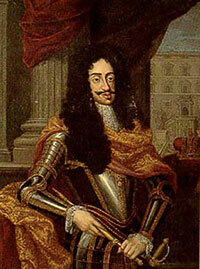 The Austrians wanted Charles III, who was Austrian. But Louis XIV of France wanted Philip V, who was French. In 1714 AD, Louis won, and Philip became King of Spain. For the second time in a century, first in the Thirty Years’ War and then in the War of the Spanish Succession, Austria lost a war with France. Cite this page: Carr, K.E. Austro-Hungarian Empire – Late 1600s. Quatr.us Study Guides, August 5, 2017. Web. April 24, 2019.